A stay at Avantgarde Hotel Taksim places you in the heart of Istanbul, walking distance from Acibadem Taksim Hospital and Taksim Square. This 4-star hotel is within close proximity of Cicek Pasaji and Cemal Resit Rey Concert Hall. Make yourself at home in one of the 117 guestrooms featuring minibars and LCD televisions. Complimentary wireless Internet access keeps you connected, and satellite programming is available for your entertainment. Bathrooms have showers and complimentary toiletries. Conveniences include laptop-compatible safes and coffee/tea makers. Be sure to enjoy recreational amenities, including an indoor pool, a sauna, and a fitness center. Additional amenities at this hotel include complimentary wireless Internet access and tour/ticket assistance. Satisfy your appetite at the hotel's restaurant, which serves lunch and dinner. Dining is also available at a coffee shop/café, and 24-hour room service is provided. Quench your thirst with your favorite drink at a bar/lounge. Buffet breakfasts are available daily from 7 AM to 10 AM for a fee. Featured amenities include express check-in, complimentary newspapers in the lobby, and dry cleaning/laundry services. Planning an event in Istanbul? This hotel has facilities measuring 431 square feet (40 square meters), including a meeting room. Self parking (subject to charges) is available onsite. 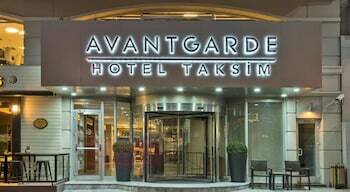 Avantgarde Hotel Taksim is an amazing Istanbul lodging choice for your trip to Turkey. With numerous amenities for guests such as fitness center, jacuzzi or spa, parking - self, you will wake up at Avantgarde Hotel Taksim feeling invigorated every day for your time in Istanbul. Don’t let this amazing reservation opportunity pass you by, book your stay at Avantgarde Hotel Taksim today to make the most of your time in Istanbul, Turkey.